Free golf cart rental included with 7 night stay. Free WIFI. This 3 bedroom, 3 bath townhouse is well maintained, dog friendly up to 20 lbs, (non refundable pet fee), completely housebroken, NO PUPPIES., and is located in front of the large pool and tennis court. One queen bedroom, one king bedroom, each with a private bath are located on the upper floor, and an additional bedroom with two twin beds and a full bath are located on the main living floor. There is also a sleeper sofa, allowing this home to sleep 8. The lake is located at the rear of the home. The pedestrian beach access is located in front of this building, but you don't have to walk to the beach. Drive the golf cart to the beach access, unload and walk down the boardwalk. There is a limited view from the upper decks. 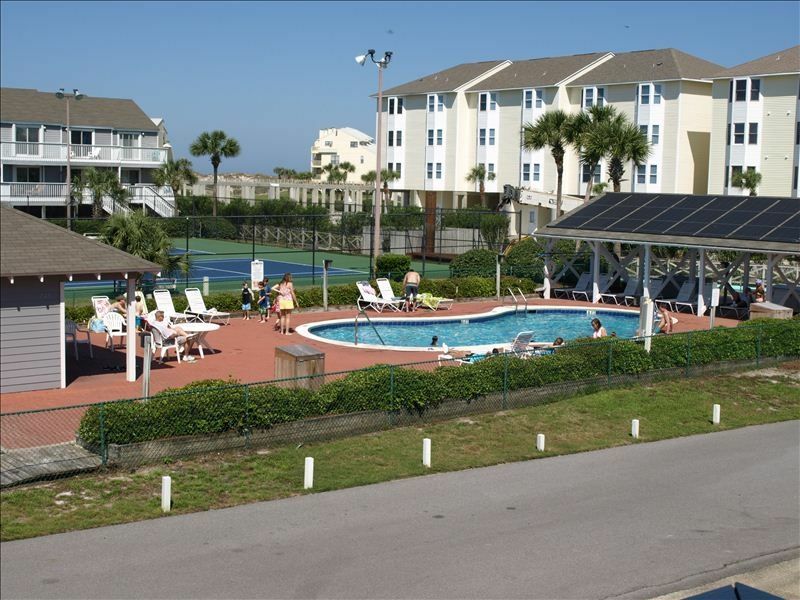 The owners provide beach chairs and tennis rackets for your convenience. Barrier Dunes is a golf cart friendly, gated community with two pools, a tennis court and playground. It is located on the North end of the Cape San Blas peninsula near the entrance to St. Joseph State Park. THE MAXIMUM NUMBER OF GUEST IS 8 AND NO MORE. STRICTLY ENFORCED! TVs in all bedrooms and living room. Next to tennis court - tennis equip provided in unit. Condo is in an excellent location across from the pool and tennis courts. It is very well maintained and very clean. A golf cart and beach chairs are a real bonus. We really enjoyed our stay. The condo is spacious and had everything we needed. The proximity to pond, pool, tennis and the beach were perfect for our 6- and 8-year-old. Great condo with everything you need for a comfortable stay and the golf cart a plus. It was so relaxing and beautiful! Our unit was so nice, with a classy beach charm. Perfect location right by the pool and tennis courts. The golf cart sealed the deal. It made it so easy to pop to the beach or over to the other units that family members were in. We locked ourselves out one day and the Earlys were so nice to quickly bring us another key. The town of Port St. Joe was really cute with good shopping and eats. Great time! We had a great week! Loved being able to ride the golf cart around in the state park and snorkeling in the bay. Extremely clean, nicely decorated, convenient to the pool made it a perfect vacation! We loved the location! The unit is directly across from the pool and overlooks a pond. My family also enjoyed having a golf cart for our daily trips to the beach. The unit was very clean and well stocked with staples for cooking or grilling during our visit. We've stayed in several units in Barrier Dunes and rank this unit as one of the BEST! This unit the owners provide the quest (a weeks stay minimal) with a regular golf cart AT NO EXTRA COST. DRIVERS MUST BE 18 YEARS OF AGE WITH A VALID DRIVERS LICENSE.